Obsession du Jour: Look! Knitting! Hey, something changed since yesterday! I started knitting something new! Wheee! It really struck a chord for me as it gets colder here in Boston and I still want to traipse all over my little city with a baby strapped into my current favorite carrier. It's our main way to get back and forth to daycare, for instance, so it's a daily issue for us. I thought this idea was a simple, cleverly designed, easily customizable solution to the 'baby wearing coat' thing. And? Bulky yarn! Fast! Easy to knit! Very little counting! After thinking about it for a couple of days, in my cloudy, sleep-deprived way, I realized that I had the perfect yarn for this already in my stash. Actually, yarn lying dormant in a dead WIP that I hadn't been able to let go of yet. Sold! Match made in heaven, even. After WB's bedtime last night I pulled out my winter coat, a tape measure, and the wool, and went to work. Ten minutes later I had a plan, and 20 minutes after that I had an inch of knitting. And then it was bedtime. Confession, it was 10:30, which is actually 30 minutes past MY bedtime these days, so I stayed up past my bedtime to knit. It's wild times here at Chez Obsession. That will be perfect for Boston winters! Yay, recycled yarn for a baby sling. I love it. But you would look so good in green. I want that coat. Wait a minute! Posting twice in a week AND knitting? Wow. That is cool! I don't think it gets cold enough here for us to need one, but I sure will look into it. Oh, and I didn't get to comment yesterday, but can I just tell you how much your post helped me! I was having an uber crappy day - one of those where you are sleep deprived and feel like you are doing lots of things but nothing well. I read your post and took great comfort in the fact that this is perfectly normal. :-) Not that I want you to go through all that, but it's nice not to be alone. 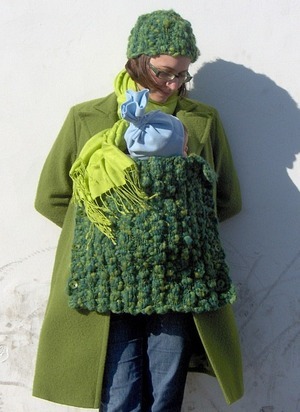 I like the idea of the baby sling cover in MagKnits. That will be perfect for you! I just loved that pattern when I saw it... I used my carriers a lot when my son was younger and would have made one in a heartbeat a year ago. What a great idea. When my son was that size we had just moved to Phoenix and were wearing shorts through Thanksgiving. I bet you'll be the envy of Boston with your own portable heater strapped to your chest.